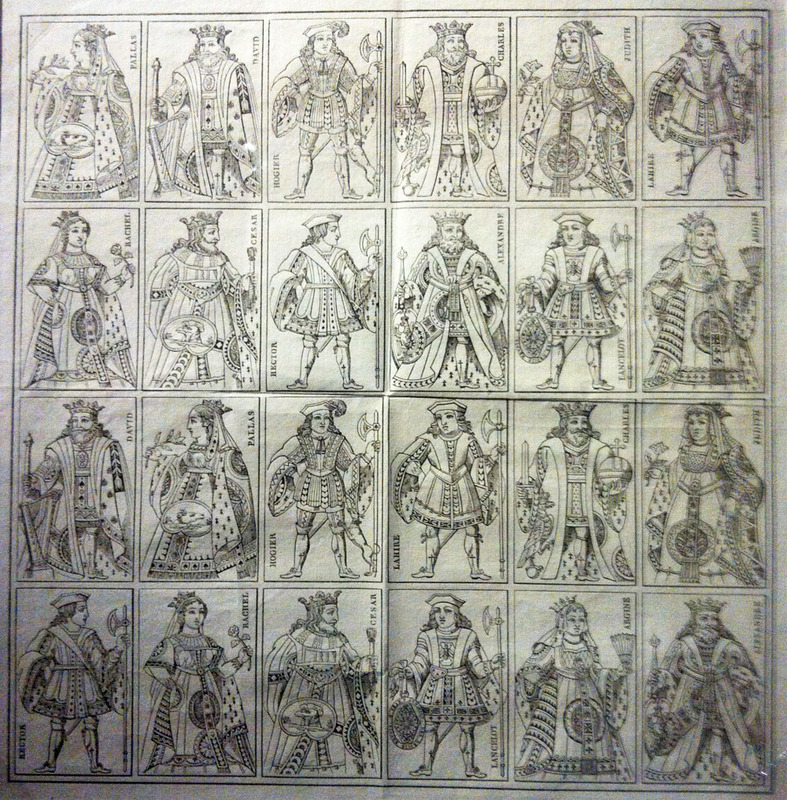 The first playing cards appeared in Europe at the beginning of the 14th century. However, even as late as the 18th century, they were by no means unified in their style. In France, the pack comprised the four classic suits – spades, diamonds, hearts and clubs (the French word trèfle refers to the clover standardised in France) and the 10 number and the 3 picture cards, knave, queen and king. In France’s neighbouring countries it was very different. For example, in Spanish and Italian packs there were cups, coins (gold or silver), clubs and swords, in German packs there were hearts, sleigh bells, acorns and leaves, and Swiss German packs had roses and shields in addition to acorns and bells. In France, card designs (and the duties paid on them) differed according to which part of the country they came from. 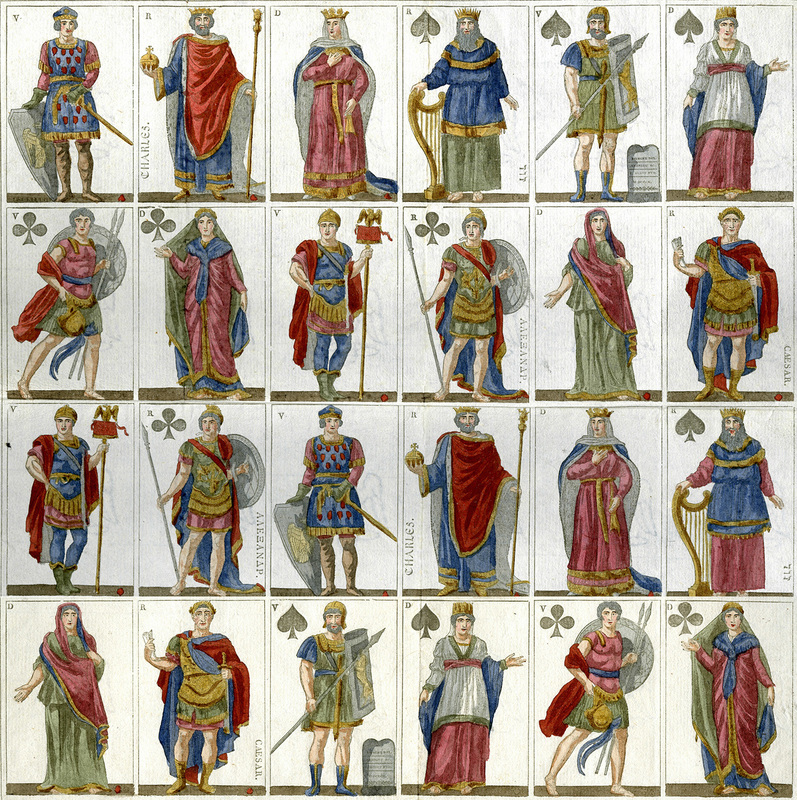 Regional portraits had identical number cards but specific portraits of the kings, queens and knaves depending on the region, whether Paris, Lyons, Provence, Guyenne or Auvergne etc. The French Revolution, with its administrative and fiscal transformations, revived and varied playing card production. 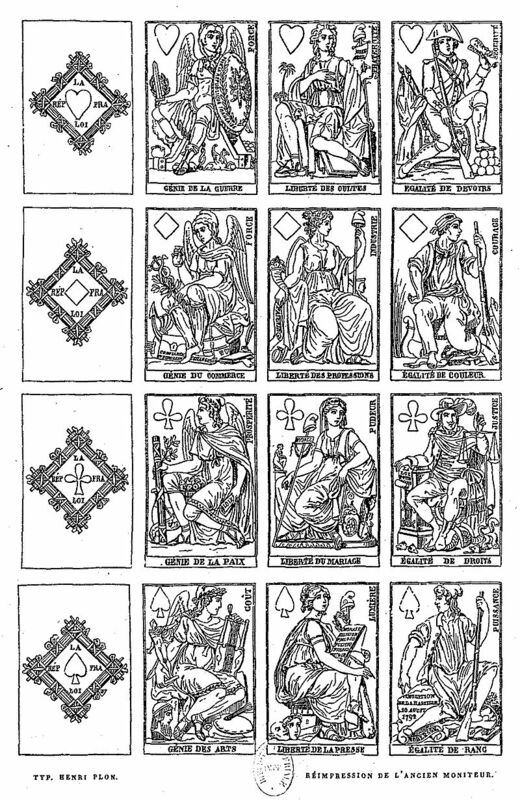 In this context, the publishers Jean-Démosthène Dugourc and Urbain Jaume took out a five-year patent in 1791 to create new designs for playing cards. Since all symbols of the monarchy had been banned, kings, queens and knaves were replaced by genii, “freedoms” and “equalities”. Along with the change of card design, the administration also set increased controls on card manufacture. There were eight steps in the card-making process: firstly, the printing paper was wetted, then printed, then it was combined with other paper to construct card before being glued together. Once the paper had been made into card it was painted, then straightened, then cut and finally sorted. In order to stop the fraudulent reproduction of these cards, marks were put on the cards and the card-making equipment: one on the moulds, one on the ace of clubs and a watermark on the ace of diamonds. Jacques-Louis David’s designs (completed in 1810) gave new precision to the figures on the picture cards. He kept the traditional kings (Charlemagne, Caesar, Alexander and David) as well as their appropriate queens (Hildegarde, Calpurnia, Statira and Abigail) with historical accuracy and precision. The creation of this new “official” pack design also made possible printing techniques not utilised before, namely stamps made by the medallist Jean-Bertrand Andrieu, which the famous typographer Firmin Didot then transformed into a mould. This new pack was distributed via stereotype and polytype; however, it was not kept after 1810 but was replaced by a new set in 1811 with modifications by the medallist Nicolas-Marie Gatteaux, which ressembled Jacques-Louis David’s 1810 design very closely. However, he corrected the most noticeable faults as well as making details such as those of the capes and coats of the kings more voluminous, and the writing of each historical figure’s name in capital letters. The four knaves were given the names of Parmenion (a general and companion of Alexander), Curion (friend of Cicero), Ogier (from the Song of Roland), and Azael (one of King David’s valiant knights). In 1813 Nicolas-Marie Gatteaux devised yet another pack, this time a reprise of an earlier Parisian model. These new cards were finer and neoclassical in style, and featured the imperial emblem including the Napoleonic bees on the knave of clubs. 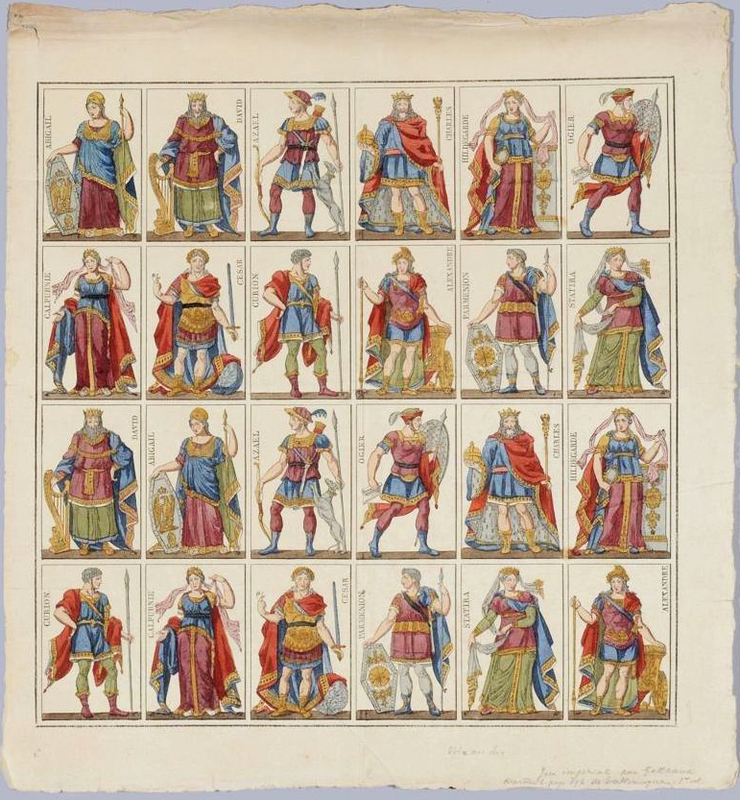 In the 1816 pack Napoleon’s emblem was replaced by the Fleur de Lys, but the pack used today in France is the 1827 version, which has two heads on every picture card. [This original prototype is currently on show in Paris at the Bibliothèque Paul Marmottan (Boulogne-Billancourt) as part of the exhibition Jeux d’Empire, until 29 July].